Stay tuned for upcoming events for Cultural Fashion Musical Night in near future. 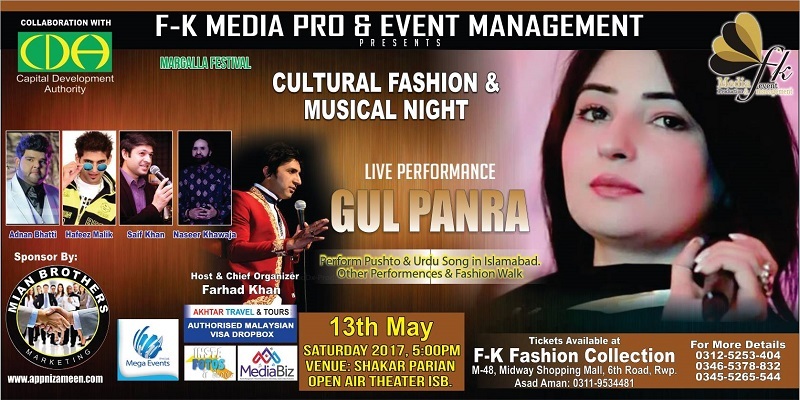 An entertainment filled Cultural, Fashion and Musical Night with Gul Panra is being held on 13 May 2017 at Open Air Theatre Shakarparian in Islamabad. Adnan Bhatti, Hafeez Malik, Saif Khan and Naseer Khawaja will also perform at this event. Farhad Khan is the host and chief organizer of this fun night. This extravaganza event is being organized by F-K Media Production & Event Management. It is part of the Margalla Festival and is being presented in collaboration with Capital Development Authority (CDA). MediaBiz Production & Event Management is an event organizer in Islamabad, Pakistan. They organize Fashion Shows, Musical Events, Company's Get together Musicals Shows, Bridal Photo Shoots, Wedding Ceremonies, Male & Female Models Photo Shoots, Promotional Activities, Opening Ceremonies, Brand Launch, Mark 3, HD, DSLR Video Coverage, Birthday Parties, Seminars and Meetings. Terms & Conditions : MediaBiz reserves the right of admission to the venue and event. Best Viewed at 1024 x 768 pixels and above. This Page loaded in 0.06736 seconds on Tue, Apr 23, 2019 (20:56).